Zentangle® founders Rick Roberts and Maria Thomas just published instructions for drawing the existing tangle Chainging and added a tangleation named Punzel. Both of these tangles are so much fun to draw and shade. “While simple in its basic element, this tangle benefits from a certain level of focus and mindfulness.” After you’ve drawn Chainging, to transform it to Punzel you visualize the continuation of the “horns” out the other side of Chainging to create sort of an “S” shape and continue their lines on that side. Maria illustrates the steps for drawing both Zentangle®-original tangles Chainging and Punzel here, along with beautiful Zentangles and studies showing variations on these two. As a side note, I’d like to welcome all the new tanglers joining this community every day. 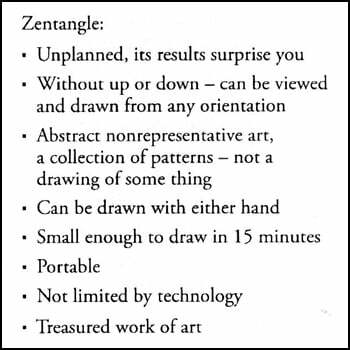 I thought it would be useful to point out some Zentangle basics and this is from the Beginning Zentangle booklet in the Official Kit (available through TanglePatterns!). I will say that it does take me way more than 15 minutes to draw a Zentangle, but I LOVE every minute of it. The point here is that it isn’t necessarily time-consuming but that it’s conveniently small and portable. And you should take whatever time you want, “one stroke at a time”®. Linda, I totally agree. I always spend way more than 15 minutes but love the time spent. In fact, I get grumpy if I don’t get regular time to tangle each week 🙂 Thanks for sharing all this great stuff with us. I am a big fan! Thanks for saying it takes you more than 15 minutes. I was wondering if I was tangle-challenged. Wow, This is beautiful. Am only a beginner so I’m going to sit and practice this one. Looks hard but I’m sure it is easier then it looks…..I hope! Thanks for the inspiration. Nola. One way to practice it is to draw a pencil string on the page and use that as a guideline to align the pattern. After a few times you will get a feel for it and be good to go without the pencil “training wheels”. With some patterns it’s good practice to get your muscle-memory ingrained for the feel of the pattern. Hope that helps. Anyone else have suggestions on drawing Chainging? Wow this is an extraordinary site. Thank you so much. Still very new at this, and this particular tangle is driving me a bit crazy.. I have had fun with this Tangle (it is a challenge). I will be in the hospital the next few days having a hip replacement, so maybe I will have time to Tangle! Just want to say “Thank You,” to all of you that have worked so hard and shared your beautiful work. ce site est vraiment très riche .Merci aux créateurs.